After the Paris Fair of 1900 it wasn’t long before escalators spread worldwide and into Australia. Australia’s first escalator was installed in Sydney. It was installed in the former Mark Foy’s Emporium on the corner of Liverpool & Elizabeth Streets in 1909. Mark Foy’s Emporium was a place to see and be seen. “Mark Foy’s magnificent new premises, which were thrown open to the public on Monday, have been the admiration of all Sydney during the last few days, and will be a new attraction for visitors from the country later on. The design of building inside and out is most uncommon. The interior is so beautifully arranged and the decoration scheme so elegant as to suggest a huge theatre or place of amusement rather than a business premises. The beautiful glass-roofed dome in the centre, innumerable skylights, window effects, mirrors, and fairy like electric light bulbs, all tend to create the impression of a splendid crystal palace. Novelties meet one at every step. There’s a magic staircase which one can ascend without the usual exertion attached thereto. – via the Freemasons Journal, Thursday September 9 1909, pg 29. However the escalator didn’t last long and it was removed by 1914 due to frequent breakdowns. The building has no record of the escalator ever existing. These days the Mark Foy’s Emporium building is home to the Downing Centre Courthouse. Sydney’s next escalator was installed in 1924 by the north pylon of the Sydney Harbour Bridge at Milson’s Point. The escalator was so popular security guards had to be brought in to control the crowds eager to joyride the new invention. Learn more about the history of escalators in Sydney in the second episode of People Movers. Listen via Omny, iTunes or your podcast app of choice. In the last episode we went all the way to Paris to learn where escalators came from. This time we’ll stay a bit closer to home and learn about the history of escalators in Australia. This will be the first of two parts. This episode will focus on Sydney and the next one on Melbourne. Australia’s first escalator was installed in Sydney in 1909. It was installed in what used to be the Mark Foys Emporium on the corner of Elizabeth and Liverpool streets in Sydney’s CBD. 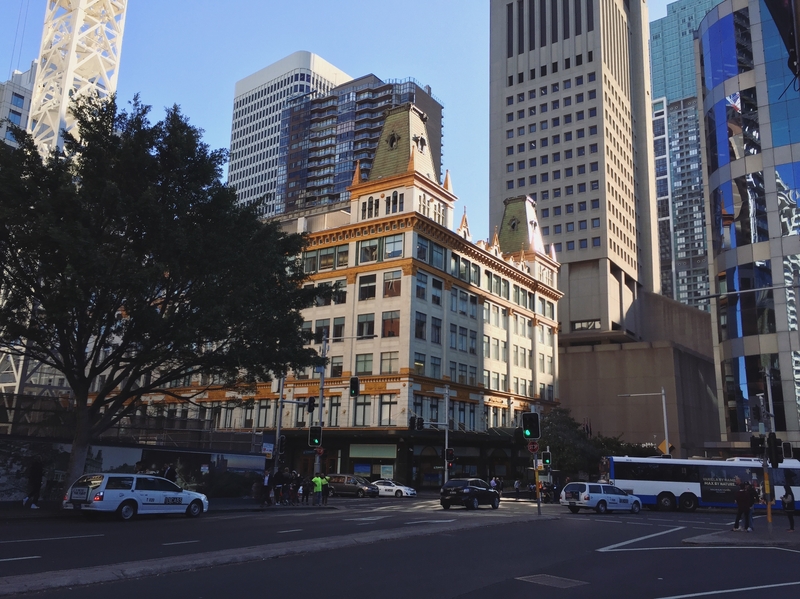 If you’re from Sydney and you’re familiar with the area – the building is diagonally opposite the Museum Train Station. If you’re not from Sydney – have a look at my website: peoplemoverspodcast.com where I’ve got photos. The building takes up almost the entire block from Liverpool street down to Goulburn street. There’s blue lettering around the middle of the building that harks back to its emporium days. Words like ‘hosiery’, ‘silks’, ‘millinery’, laces, gloves & corsets show the building’s age. When the building was first opened there was an article written about it in the Freeman’s Journal – a newspaper that’s now defunct but one that circulated from 1850 – 1932. The article wrote: “There’s a magic staircase which one can ascend without the usual exertion attached thereto.” in reference to the escalator. Mark Foy’s closed in 1980 and was taken over by Grace Brothers who traded there until 1983. In 1985 the building was converted to a courthouse. The building was renamed as the Downing Centre in 1991 in honour of Reg Downing, a former NSW Attorney General and Minister for Justice. These days the court deals with cases like drink driving, assault, drug possession, robberies, fraud and sexual assault. If you live in Sydney you might have been inside for jury duty. I visited the building the last time I was in Sydney but I was too scared to talk to anyone inside so I had no idea if the escalator was still there or not. When I got home to Melbourne I tried to find out the only way I know how: via email with as little human contact as possible. First I contacted the NSW Office of Environment & Heritage and a nice woman named Jackie got back to me straight away. I thanked Elaine from City of Sydney and went ahead with contacting Mark. Mark Dunn has a Masters degree in Applied History from the University of Technology and a PhD from the University of NSW on the Colonial Hunter Valley. Did I feel silly asking someone so experienced about something like escalators? You betcha. But luckily for me – Mark took it in his stride. And conveniently for me too – he was no stranger to the radio. L: Oh yeah I think I’ve seen that on the internet. How long did you do it for? But I didn’t call Mark to swap stories about his hay days in radio. The reason why Elaine from the City of Sydney recommended him to me was because of an oral history he did on Sydney trains. I asked Mark to tell me a little bit about it and about his relationship with escalators. M: They were removing the timber escalators out of Wynyard station which had a big bank of four and out of Town Hall station which had two surviving timber escalators and they decided that they would speak to some of the workers and get a bit of a history going around the escalators so they got us to interview some of the engineers that look after them now, some of the workers with Otis: the company that installed them and then a couple of heritage people that were doing assessments and various things and station managers who looked after them. And the company I was working with we did all of the oral histories on film and then they filmed the process of the escalators working and how they work and then they filmed the removal and I think they were going to film the replacement of them. L: Did that project, like researching that, were you particularly interested in escalators before you did that and are you particularly interested in them now as a result of it? M: I wasn’t overly interested in them before. I’m a historian but I’ve worked in heritage in Sydney and around the place for 20 years and I used to work with an industrial archaeologist so I was pretty familiar with that kind of technology and I was reasonably interested, I’d certainly come across old ones in the past. But I suppose prior to that I wouldn’t have called myself an expert. But it was an interesting process to research. I suppose the most interesting part of it was not so much the technology of them because they’re pretty standard thing, once they kind of refined the technology in the 1920’s and 30’s they haven’t changed a huge amount since then but what I found interesting with this project was the reactions to escalators from the public at the time of their installation. M: Well it’s one of those where now we take it for granted that you go somewhere and there’s going to an escalator or an elevator to take you up and down between floors or in and out of subways but when they were put in, particularly the first lot in Sydney. So the Marks Foy’s one was 1909 but then the first lot going into a railway station in Sydney was 1926 which was part of the temporary railway station at Milson’s Point when they were building the Harbour Bridge there used to be a railway station right at the point of Milson’s Point right underneath what is now the north pylon of the Harbour Bridge. So they had to move that back around the corner which was a much steeper site and they installed the first major set of escalators there in 1924 which ran from the ferry wharves up onto the cliff above which was where the busses and the trams were terminating. So you had escalators running down to the railway station and the ferry wharf and when they put them in in 1924 they had so many people turn up to joyride them basically, they would go up and down and up and down, some for hours on end, that they had to get police and railway staff to stand at each end to actually instruct people on how to use them because they were totally freaked out by this new fascinating machine. And when you look at the newspapers around that time and when others are getting installed in department stores and the rest they’re a major feature of the advertising for these places because they were such a novelty. M: The ones built at Milson’s Point in 1924 the newspapers had photos of people riding them and being called the joyriders, and articles titled ‘do you escalate?’ and all this sort of stuff and the same as the ones at Wynyard. The Wynyard ones they were a bank of four so they were the biggest ones in the southern hemisphere for a good while and they were included in school excursions for years in Sydney into the 1950’s. Country schools would come in and they would go there to see the escalators. So they were a big deal. All of this started, of course, with me wanting to find out of the Mark Foy’s escalator was still there. Mark had told me via email that the escalator was removed sometime before 1920 but he couldn’t be sure exactly when. L: Just going back to the Mark Foy’s escalator that you mentioned before. Do you know when that one was removed? M: It was installed in 1909, they had removed it by 1914. I can’t find the exact date unfortunately but it’s definitely gone by 1914 so it only lasted about five years. Basically while they advertised it as the first thing and it was quite the hit, it had a lot of break down issues and mechanical issues which meant eventually it was removed. L: So that’s why it was removed? Because it wasn’t working effectively? M: Yeah that’s right. And so the next lot that go in are those ones in 1924 with the railway at Milson’s Point and then there’s a bit of a spurt of installations so there’s a whole bunch of department stores in Sydney start putting them in around the 1920’s so we get a whole bunch of them suddenly appearing. L: Do you know if there’s anything in the building remembering the escalator or indicating that the escalators were once there? M: No I’m not aware of anything in there. I did some work there a while back on a conservation management plan and there was nothing that I remember from that that had anything to do with the old escalators. There’s no infrastructure in the building about them, that’s for sure, they’re totally gone. And I don’t remember there being any kind of information or plaque or anything about it either. I think they were gone so long ago they’ve been kind of forgotten. I thought that was a little bit sad. Sure – the escalator may not have worked very well but to not commemorate it ever being there in the first place seems a little bit rough. That got me thinking about the accessibility and availability of this kind of knowledge and history. Why did it take me: a university educated Very Serious Escalator Journalist, interviewing a historian with a Masters Degree and a PhD for a podcast to find out that this escalator no longer exists? Surely this information should be readily available somewhere online. L: And I also wanted to look at how the history of escalators is recorded and remembered in Australia. Just from my research I haven’t found a heap of information online, at least not in a way that’s accessible to a normal person who’s not a historian. Do you think that the history of escalators is recorded in a way that’s accessible to lay-people? M: No. You could be a pioneer in this respect. No it’s not because even with all my experience I didn’t find it easy to find information about escalators in Australia basically. In terms of a general book or a general website on escalators in Australia there’s almost nothing as far as I can find. L: Do you think people would be more interested in them if it was more publicly available? M: Yes and no. The escalators themselves are kind of only just interesting in some ways because once you’ve got your head around the technology of the machine there’s not much more to tell. But they are kind of interesting in more of a social aspect. What I found interesting is the way the change people deal with the city – so they make things like big railways and underground railways possible because without them you can’t safely move the numbers of people you need to make those places viable. So they transform other spaces through their technology so they make things like Myer and David Jones and those places possible because you can move people quickly and efficiently through a space and they make underground railways possible and now everything else. The interesting thing that I found was how they changed the way cities work. Not so much the technology themselves but I suppose in some ways how often it is that a simple idea can have fundamental changes on the way places work and this is a pretty simple idea. It is just a conveyor belt with inclined steps on it and it wasn’t a new technology but it was a new way to put that technology and it totally changed what you can do. Finally I asked Mark what he thought about the idea of an escalator history museum. L: I want to make a bit of a pitch for an escalator history museum. How do you think that would go? Do you think there would be enough history to fill a museum even if it’s just a small one? M: I think if you had access to early technology and the changing nature of it I think you could probably do something with it. I don’t know if you could do it in Australia though because so much of the technology and design was done elsewhere. Certainly it’s interesting.. I’m not sure.. You could probably do something around using that as a spine of a social history of cities around escalators.. Yeah maybe.. In the next episode I’ll be looking into the history of escalators in Melbourne. Oh and by the way – if you’ve heard about the new escalator art installation in Wynyard station and you’re wondering why I haven’t talked about that at all in this episode – I’ll get into that later in the series. You can follow People Movers on Instagram: we’re at people movers podcast. Full transcripts and more information can be found at people movers podcast dot com. You can find it on iTunes or your podcast app of choice. Once you’ve done all that – leave me a nice review and tell your friends. The music in this episode was provided by Tim and Dave of Umbra. Find them on Facebook at facebook dot com slash umbra duo.